Rock Of Ages, an English movie, is not currently screening in Hyderabad. An adaptation of a 2006 Broadway musical of the same name, Rock Of Ages is also a musical, and deals with a couple chasing Hollywood dreams. Sherrie (Julianne Hough) wants to be a singer, and Drew (Diego Boneta) wants to be a rock star. They chance upon each other when Sherrie is travelling to Los Angeles from Oklahoma, and a romance sparks off. 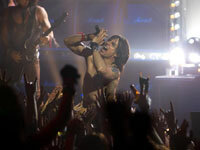 Rock of Ages, it'd be pretty reasonable to say, is Tom Cruise all the way. Right from when he rises from a pile of women with a flashy animal head at his crotch for a belt, and thong-style leather pants, to when he signs off - it hard to see beyond him. Sure, there's the music, a nice little romance and many clichéd characters and events, but really, it's Tom Cruise that you will be waiting to see all throughout. fullhyd.com has 700,000+ monthly visits. 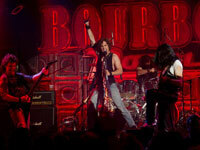 Tell Hyderabad what you feel about Rock Of Ages, and then also see all user reviews for Rock Of Ages!